I did a weee bit or research. been a bit of mystery to you? Hawaiian flowers, plants and vegetables. unique as the designs and designers themselves. and created many of her own designs. Her bed quilts could fetch $6000. Hawaiian Quilts were/are considered very precious. So...what do YOU think about Hawaiian Quilting? Important...Put Mystery Monday in your subject. drawing will be Wednesday June 22nd, midnight MT. Okay it's time to ....CELEBRATE!! info and fun projects on her blog. Hawaiian quilts are lovely but look very intimidating! My daughter is Princess Kaiuluni's great great granddaughter. She and I want to go to Hawaii so badly someday to see the palace that her greatgrandma spent time in. Her grandmother grew up in extreme poverty. They had 17 girls...and then adopted a boy. They even ran out of names. Amy's grandma is named Theresa, but has a sister named Teresa. All the family tries to keep the heritage by giving their children Hawaiian middle names. Amy's is Kapua. (blossom). The quilts are beautiful and the heritage is beautiful. I took an online quilt on Hawaiian quilting last summer. I failed - well, I never finished it. It will probably remain one of the UFO's forever. I think I tried to get too detailed for a first time. I've only done a tiny bit of applique so far. I think a Hawaiian quilt is beyond my talents at this point. They sure are pretty. They are beautiful but way beyond me at this point. Although I really appreciate the beauty of Hawaiian quilts, I'm not that crazy about them. Maybe it's becuz of all the really hard work that it takes to make one! I have a hard enough time piecing the traditional quilting shapes together. I certainly couldn't do the applique that is involved with the Hawaiian quilts. Talk about intricate work!!! Definitely not for me. Annie, thank you so much for that lovely post...I have always loved Hawaiian Applique quilts and would love to try one someday. 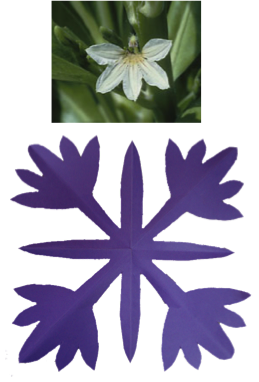 I love applique but I am sure it would be quite challenging. I love the photo of Deborah working on her gorgeous quilt. These quilts are extremely challenging. I shudder when think that one mis-cut can ruin the entire applique piece. That said, some of the individual techniques are great in regular quilts. I used the concentric echo form of Hawaiian hand quilting on a quilt, and it really does work well. It is time consuming, yet enjoyable to do. How amazing is that red quilt on the four poster bed. I don't think I've ever seen a Hawaiian style that big before. You made me go looking into Hawaiian quilting sites. I too would be intimidated to try, but oh my they are just beautiful. Thank you for an interesting look into another form of quilting. These are such beautiful quilts! I love looking at them!! I LOVE Hawaiian quilts...considered doing one eons ago...today there would be no way. I will just ENJOY DROOLING over them and the beautiful workmanship! It took me so long to finish one applique wall hanging that it would probably take me 10 years to finish one of those Hawaiian quilts. I do need to start a new travel project though.... Maybe I could try my hand at a small version. 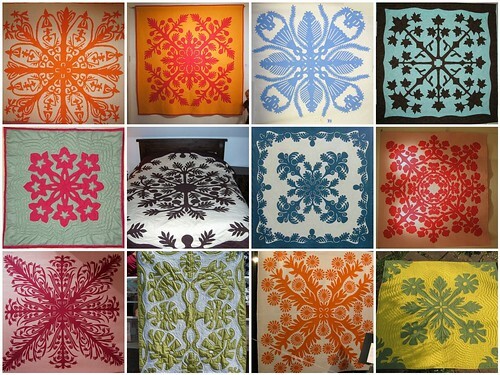 I love the look of Hawaiian Quilts and would someday hope to try one! The quilts are very stunning! thanks for such a great post. I love the Hawaiian quilts - each so beautiful and unique. Thanks for this fun giveaway and for sharing links for more information. I love the Hawaiian quilts. A friend of mine is always appliquing one or quilting one. Just beautiful. I have tried one block so far and hope to make more. Hawaiian quilts are beautiful, but I don't think I'll ever make one. Thanks for the giveaway and for sharing the info about the Hawaiian quilt. Hawaiian quilts are beautiful but I don't think I'd have the patience to make one. I think they are gorgeous. I love the shadow quilting. And the colors. I don't think I've ever seen one I didn't like. I admire Hawaiian quilts greatly. I doubt I would ever attempt one myself, although I've learned one should never say "never." I didn't know about the designs being kept secret in days gone by. blocks popular in Baltimore Album and Red and Green applique quilts to the highest possible level. They are simply gorgeous. I just became a follower-its always fun to find new blogs to read. They are incredibly beautiful, but I'm not sure I could do one. I went to Hawaii more than 25 years ago before my husband came along and swept me off my feet. Wish I could still fit in the muumuu I bought while there. I think Hawaiian fabrics are beautiful. The Hawaiian quilts are beautiful. Not something that a beginner (me) would want to tackle. I'm loving the restricted color palette. I may not be able to do a hawaiian quilt but i think i may limit my colors and try some applique on my next one!